For some reason, Masonic buildings seem to be on two ends of a spectrum. On one end, the building is imposing, i.e. the Detroit Masonic Temple. On the other end is a building like my lodge's, a facade that disappears into downtown. In both cases, the community can feel a bit put off. So, what do we do? A lot of lodges smartly host community events, meet at neighborhood functions, and perform other outreach ideas. But there are always more good ideas that we can employ. One idea that is coming out of Hudson, Wisconsin that is garnering a lot of attention is the Little Free Library. The concept is relatively simple. A neighbor puts a box that resembles a dollhouse on top of a post. Inside the small house is a shelf or two of books. The books are donated by the community, including the Steward of the Little Free Library. At least from all the articles, once the Little Free Library is installed, the community starts to come together. It becomes the community watercooler as people gather to see what books are there and to chat about what's going on in the neighborhood. The library is filled with an eclectic mix of donated books and the books are labeled with the phrase, "Take a Book, Leave a Book." I was thinking about how this idea could be used by Masonic lodges, especially those with front lawns. Think about it. The Little Free Library could be filled with interesting Masonic tomes, books about self improvement, Dan Brown books, or whatever the lodge that meets there thinks is a cool idea. The Little Free Library is cheap to build and can be made with recycled material. The cost for registering it on the map is a paltry $34.95. I think this idea is great. Just think, a nice looking box of books open to the community to share would be something unique and acceptable to the neighborhood. 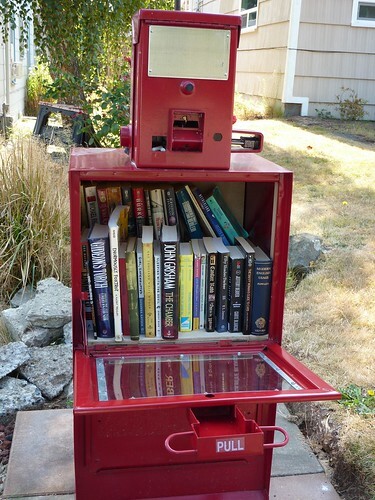 In one article I read, a comment is made that the Little Free Library is like a porch that extends to the street. I think this is a wonderful community outreach program that doesn't cost much money and would extend porch of King Solomon's Temple to the street. Let's make this happen. What do you think? Should Masonic Lodges put Little Free Libraries in front of their temples? Leave a comment below. I think that this is a great idea! I have seen these in St. paul and my brother has one down the street from him. The investment is very small. I know some people may be afraid of them getting vandalized, but it would be a wonderful way to get all those extra copies of Dan Brown's 'The Lost Symbol' put to good use. You can comb the local Salvation Army for them. I usually see a few copies sitting around for a dollar or so. This is a great idea - especially for the NMJ of the AASR who have learning centers in their buildings. I already forwarded it on to several contacts. Thanks for the post! So true, I'm surprised that Goodwill doesn't refuse to take copies. I have enough copies that I could easily get rid of a few and not even miss them. Also, our Grand Lodge's book club would be a great source of books. The hope is that the community will add their own favorite books. It's kind of like Geocache tracking bugs, only their books. This is great to hear. It may be as simple as getting a newspaper dispenser. A lot of newspapers have extras that sit collecting dust. You may even be able to get them for free. Thanks for the idea Brother. I'll be introducing the idea to my Lodge, Catlin Masonic Lodge 285 in Catlin, Illinois!